Bio-Cide’s EnviroCON® product is highly effective in eliminating odor-causing microorganisms as well as those associated with mold, mildew and bacterial growth. As the industry leader in chlorine dioxide technology, Bio-Cide International has developed and patented numerous applications directed at controlling microorganisms. Chlorine dioxide is a powerful antimicrobial compound effective against a broad range of both gram-positive and gram-negative organisms as well as yeasts and molds. A point of contact application, EnviroCON® eliminates odors at their source through a chlorine dioxide release-process that destroys organisms at the origin. EnviroCON® uses no perfumes or masking agents. An enhanced benefit of EnviroCON® is its low toxicity and safety rating from the EPA. As a result, EnviroCON® may be used in occupied spaces. EnviroCON® does not use any environmentally damaging propellants or flammable ingredients. Use EnviroCON® as a part of a regularly scheduled maintenance plan to ensure fresh clean air. For bacteria, mold, mildew, fungi and algae, there is not an easier, safer or more effective product on the market. For deodorization or general odor control, apply a liberal amount of EnviroCON® to the origin of the odor. For example, apply EnviroCON® directly to system duct work, drip pans, evaporator coils and other associated air conditioning elements to eliminate odors associated with bacteria, mold, mildew, fungi, yeast and algae. For stasis microbial control, the system must first be cleaned, then followed up with a routine maintenance program of EnviroCON®. Apply a liberal and non-diluted amount of EnviroCON® into the system intakes while the system fan is running to ensure complete microbial environmental control. Surfaces should be lightly coated. One gallon of EnviroCON® will treat approximately 1000-1500 square feet. Applied with a hand-held atomizer or an air-driven sprayer, EnviroCON® is easily applied to all HVAC systems including commercial, industrial, institutional and residential. In addition, EnviroCON® is currently used in health care facilities, kitchens, restaurants, offices, hotel and motel operations, recreational vehicles and homes. Residential homes and apartment complexes should be treated two times per year or as needed. Commercial, industrial buildings and health care facilities may be treated every month to ensure effective environmental control. EnviroCON® should be part of an overall Indoor Air Quality Preventative Maintenance Program. One of EnviroCON®’s key features is its low toxicity and safety rating by the EPA. Rated as a category IV, the lowest EPA toxicity rating, EnviroCON® can be applied directly to HVAC system duct work in populated areas. The lowest EPA toxicity rating means there are no harmful dermal (skin), ocular (eyes), inhalation (breathing), or ingestion (swallowing) effects when using EnviroCON®. EnviroCON® does not use any propellants or flammable ingredients, enhancing its safety qualities. 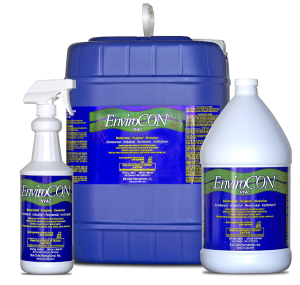 EnviroCON® is a NO-RINSE product, making it very easy to apply. Once EnviroCON® is applied, it dries leaving the system virtually residue-free.